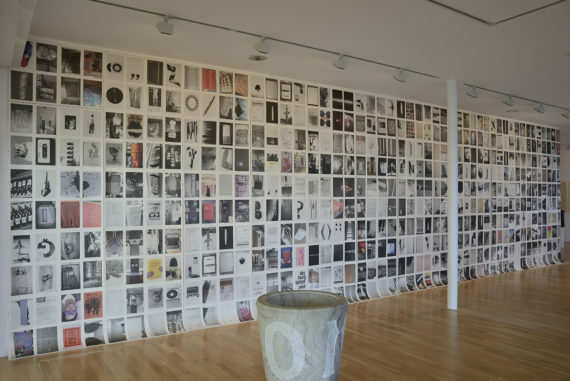 For her current exhibition at De La Warr Pavilion in Bexhill-on-Sea, Fiona Banner ranges across graphic and font design in her continuing exploration of language and form. Dany Louise talks to her. 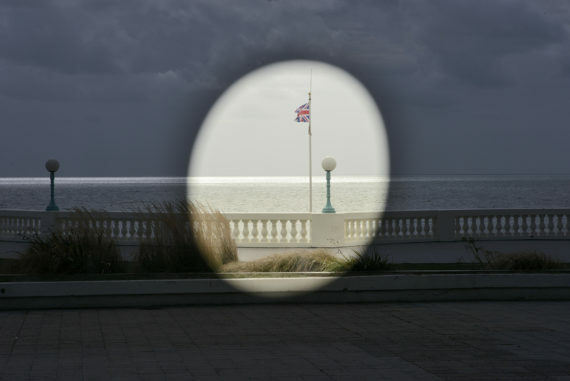 Approaching the De La Warr Pavilion along the seafront at Bexhill-on-Sea, four imperfect black spheres drift in the wind above the pavilion, signalling something unusual is taking place within and without. Tethered to the roof, these misshapen globules look like enormous drops of oil – rich, black, shiny blimps. They are part of ‘Buoys Boys’, Fiona Banner‘s substantial new show at the gallery. 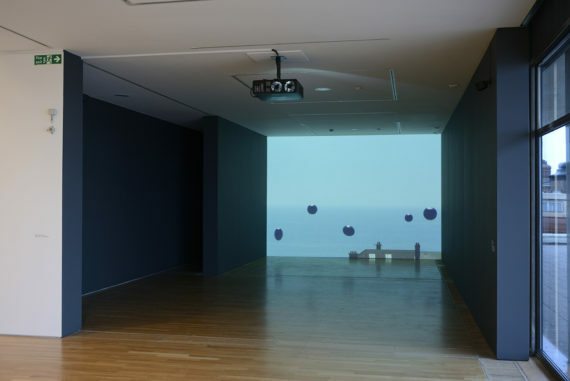 There is a lot in this exhibition, which illustrates many of the ongoing preoccupations of the 2002 Turner Prize-nominated artist. 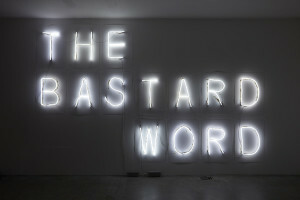 Using various mediums and installations, it ranges across graphic design, the trickiness of language and meaning, the weightiness of books as both repository and object, and –although only referred to obliquely – a kind of fascination with testosterone-driven boys-toys of destruction. 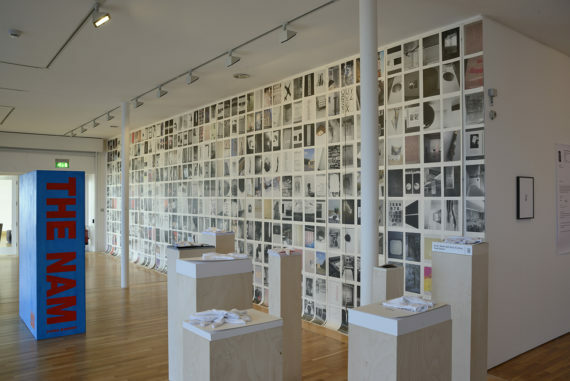 The gallery space is divided into zones of works, including Buoys Boys, a new film commission specifically for this show; a series of her enormous ‘poster-drawings’; and many books published by The Vanity Press, Banner’s pseudonym and publishing house. These publications are displayed as interactive objects on exactly book-sized plinths and include her 1,000-page The Nam (1997), in which she writes a scene by scene account of six Vietnam war films (Full Metal Jacket, The Deer Hunter, Apocalypse Now, Born on the Fourth of July, Hamburger Hill and Platoon). One book, a sunset yellow hardback encased in glass, has the title No Image Available in red text. 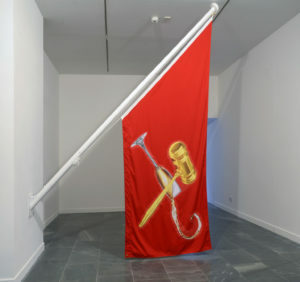 For me, this work sits at the centre of Banner space – ironic, conceptual, humorous, knowing and contradictory. The interpretation for the gallery is presented as another seductive object – a tower of A3 paper, stacked and glued along the spine, printed as an unfinished sheet, ‘unfolded and untrimmed’. It’s an enormous book from which visitors tear off pages, gradually reducing it in size. 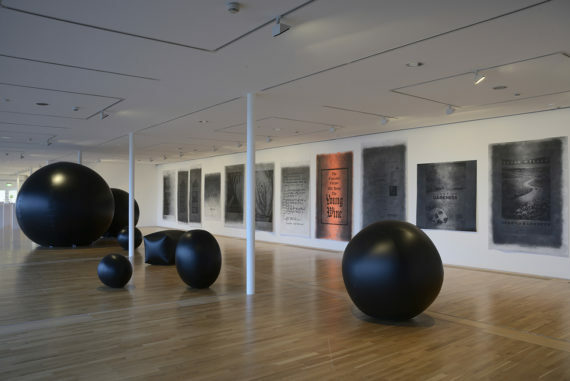 In the centre of the gallery are more large inflatables, tamed and sitting on the gallery floor, literal blow-ups of full stops taken from a variety of printing fonts. Banner’s baptismal Font is in the entrance, and this, the wall vinyl and the interpretation feature Banner’s ‘house font’, a typeface she created in 2015 and which she describes as “an unpredictable bastardisation of styles and behaviours”. What is the origin of The Vanity Press, and the intentions behind it? The Vanity Press came about when I realised that books and publishing could be up to me. I didn’t want to be reliant on the gallery system and I enjoy the democratic nature of self-publishing. Verbal language can only take me so far, which is how the full stops came about. Fonts and the materiality of language is one of my key mediums. My work is densely verbal which has lead me into an unexpected relationship with language. This show explores a sense of not always knowing where things begin and end, which is how life runs and is reflective of how I work. I’ve come to think that the idea of the autonomous work is less interesting. Revealing something about the process is a truer place for me to be within the setting of a gallery space. You have often said that you are uncomfortable with ‘the image’. Is this the origin of your use of text? Text is at the forefront of my studio activity. I found the image too complicated and loaded. I couldn’t find a way of doing it so I started working with language. I had been exposed to films such as Top Gun and Apocalypse Now as cinematic phenomena, and I started to realise that my understanding of Vietnam as a conflict zone and geographical place was informed by these movies. The driver to make The Nam was my own ignorance and acknowledgement of my willingness to be seduced by Hollywood propaganda works. I then became fascinated by the act of writing this pictorial space, translating it into black and white space, and the translation of that from a male to female viewpoint. I employ a female slyness with how I approach the material. It’s there in everything that I do, and is central to it. There is a strong sense of obsession in those early book works. How did you make them? I did The Nam over a couple of months. I first did Apocalypse Now on a ginormous cinema screen-sized piece of paper. The second one I did on an ancient Amstrad! My interest was in allowing the process to reveal things I hadn’t consciously set out to reveal. Your work has developed considerably from the early pieces for which you gained attention. How do you describe this evolution and maturity? I’m still a person in the world, different from when I was 24. I’m still observing and reacting, still trying to understand the inexplicable nature of the world we live in. The best way of doing that is to use a variety of different forms. What I’m interested in is the attempt to make language and form. Some people want to be masters of a craft but I’m slightly suspicious of the term ‘good’. For me, art is about revealing something, not necessarily about being good at something. For example, neon is a denial of the hand. It’s about something cool and abstracted, and an ISBN is a depersonalising system. I made the neon piece, which is wobbly and obviously hand-made, to reveal that human process. Your work gives me a strong sense that you are trying to reach to the heart of something, to articulate something that is very hard to define. What might that be? I don’t think there is one heart. It’s a moving, ever-changing place. What is really nice is when a work speaks back to you, reveals something and leads you onto the next thing. Ideally you don’t know the work you make too well. But then I think art means different things to different people. The myth surrounding art is that it’s static. To some extent it’s a living thing. Everything is subject to time and space; context and history.